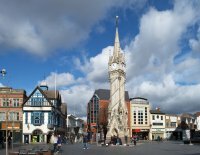 Voted by Gay Times as the 4th best place for gay men and lesbians to live in Britain, Leicester has a fairly large, vibrant and diverse gay scene, some tremendous bars and its own Pride festival around the end of August / Early September. With a large student population (2 universities) and well established gay friendly bars and venues, it's certainly worth checking out. As with many towns and cities, the number of gay venues has declined as habits change together with the growth of online dating apps apps. Most venues are now mainly gay friendly and attract a mixed vibrant crowd. The Rainbow and Dove, The Dover Castle and Helsinki in particular are still going strong and pulling in the numbers. Leicester Pride 2019 is Leicester's annual Lesbian, Gay, Bisexual and Transgender (LGBT) festival, held at the end of August / beginning of September each year There's much more to Leicester Pride than the one day event and, the festival will span a full nine days with a series of art, culture, sport, music and film events celebrating the great diversity of the LGBT community.This years event parade and party in Victoria Park takes place on Saturday 31st August. 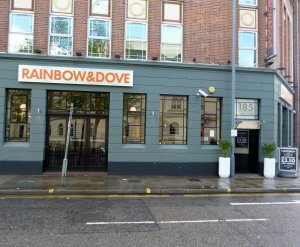 Summary: Stylish gay bar in centre of Leicester offering food and regular drinks promotions. Busy throughout week. Trendy young crowd. DJ, dance music/ video screens etc. Monday evenings: Pink Pounder from 5 p.m., Tuesday evenings: Cocktail Night from 5 p.m.
Fridays: Funky pop and chart sounds. Summary: Apparently the UK's oldest gay pub. Dance floor and beer garden. Regular cabaret. Summary: Gay bar and night club playing dance classics and the latest tracks. 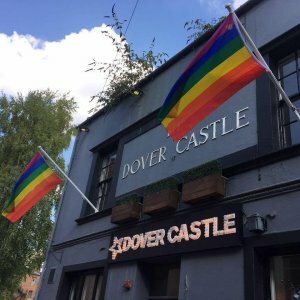 The nightclub, which has been under the ownership of James Cockerill for the previous two years and is a sister venue to Dover Castle and Rainbow & Dove, has a huge lineup of DJs and entertainment for tonight's celebrations. Hosted by Dizzy Fierce, DJs for the night come from Helsinki favourites DJ Richard Moon, Readers' Award nominee DJ Dukes and DJ Nick B with stilt walkers, fire breathers, angle grinders and dancers providing revelers with visual entertainment all night long. Wed 10pm - 3am Pink Pounder! Sat 10pm - 4am The Big Saturday Night Out! Summary: Amigos is now well into its second year and going from strength to strength! we have a google rating of 4.8 out of 5 stars, the best in Leicester, proof that the biggest is not always the best! We are told we are the cleanest and friendliest sauna around and we want to get even better! It's great to have so many of the customers from the old Bond Street days back as regulars and to see so many new faces too! We welcome you all and thank you! 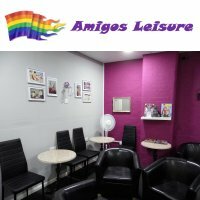 Open 7 days a week, Amigos boasts all new facilities, coloured lighting in corridors, making it a safe and clean environment to come play or chill and relax. Summary: Leicester Gay Sauna located in city centre, just a two minute walk from St. Margarets Bus Station or ten minutes walk from Leicester Train Station, Splash Leisure gives you everything you need from a Gay Sauna! We are Leicesters only fully gay owned and gay run Sauna. Most friendly Midlands gay sauna providing a perfect environment to relax. Our facilities include Large Steam Room and Sauna, Jacuzzi Hot Tub, range of private rooms, dark room and TV room. We offer a range of hot and cold snacks, including our freshly made toasted cheesy sandwich, free tea and coffee, and a fully licensed bar, the only licensed Gay Sauna in the Midlands. Opened 2 years ago, we are Leicester's friendliest and busiest Gay sauna. Tucked away on New Bond Street, you enter through our discreet door up to the first floor and its all on one level. Why not chill out in our Cafe-Bar area with a beer or soft drink before the fun begins! !